Meals were great today. Plan did call for Kaboch squash soup..ick..if you read my post yesterday you’ll know I did not like it, so instead I had some leftover Hearty Vegetable Miso Soup. During the Reset you can replace any meal with another meal in the same week. I haven’t substituted much but this soup I did. Breakfast was 2 cups of fruit. We had half an Asian pear, a small apple, some red grapes, and a few strawberries. Heat oil in soup pot on medium heat. Add onion, garlic, ginger, carrot, and celery and sauté for 5 minutes until fragrant. Add water and simmer on low for 20 minutes until veggies are tender. 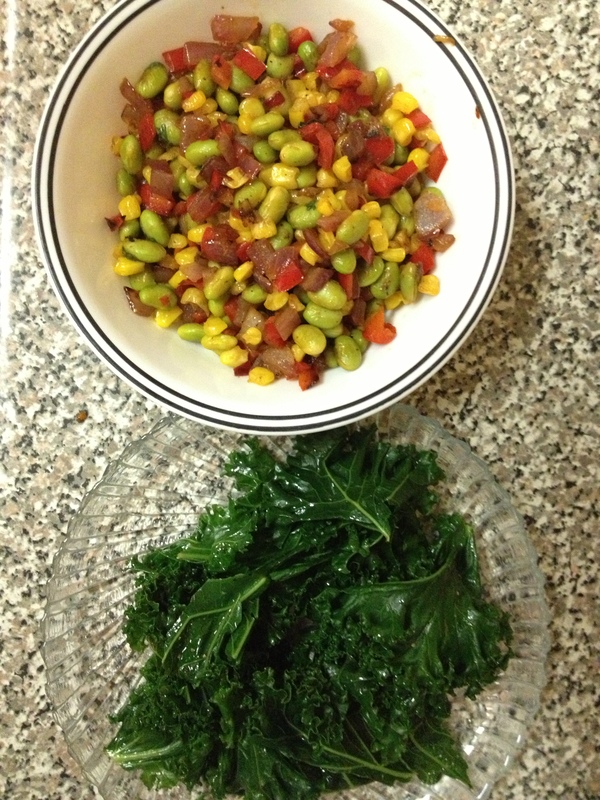 Add broccoli, beans, cabbage, and seaweed. Stir and simmer until tender but not overcooked; broccoli and beans should remain crisp. Remove from heat and add sesame oil, green onion, and miso mixture. Serves 1. Preheat oven to 400° F and arrange corn in single layer on baking sheet. Roast for 10 minutes, or until caramelized and beginning to brown but not harden. Remove and let cool. Meanwhile, bring water to a boil and cook edamame for 5 to 7 minutes. Drain and set aside. 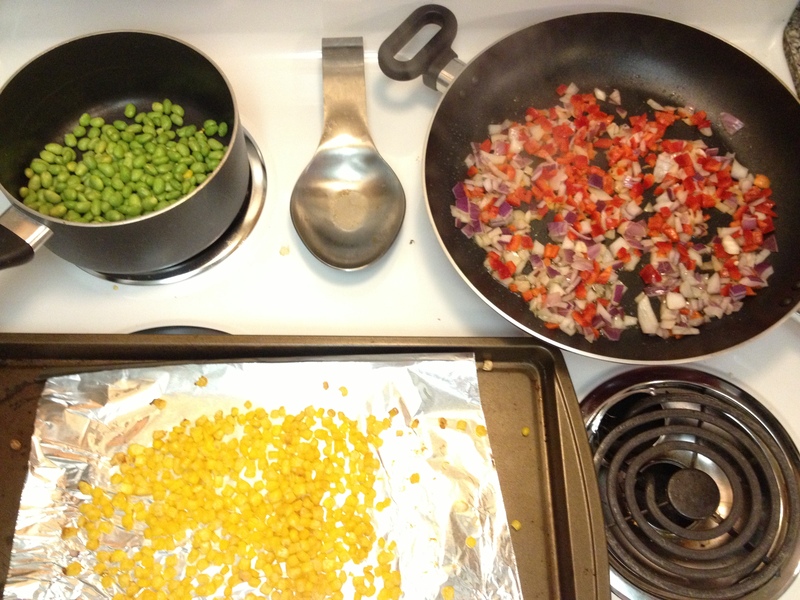 Sauté onion, shallot, and bell pepper in olive oil for 10 minutes or until soft. 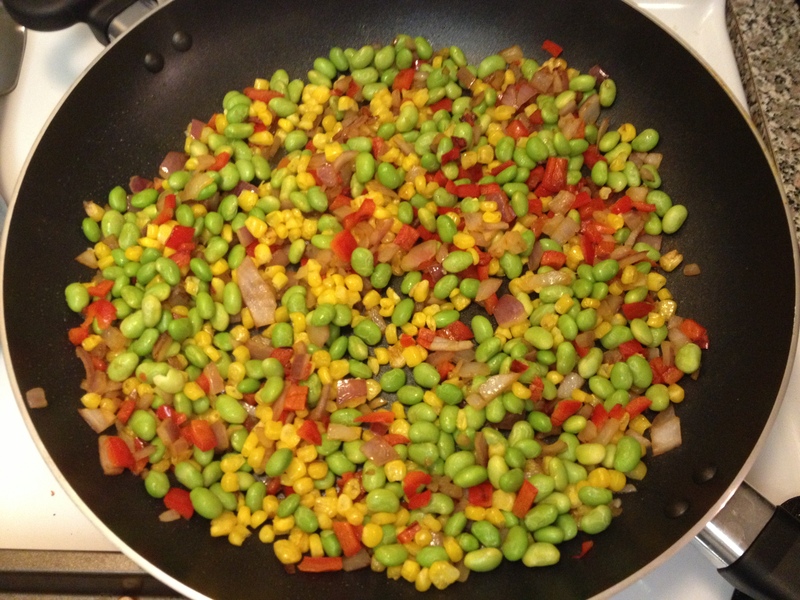 Add corn and edamame to onion mixture; cook on medium for 5 minutes. Add vinegar and remove from heat. Stir in lime juice, cilantro, salt, and seasoning. Serves 1. Wash kale and remove stems and center ribs; cut into bite-sized pieces. Steam until bright green and tender, about 3 to 5 minutes. Toss with remaining ingredients. Serves 1. We also did our grocery shopping for Week 3, The Restore Phase. 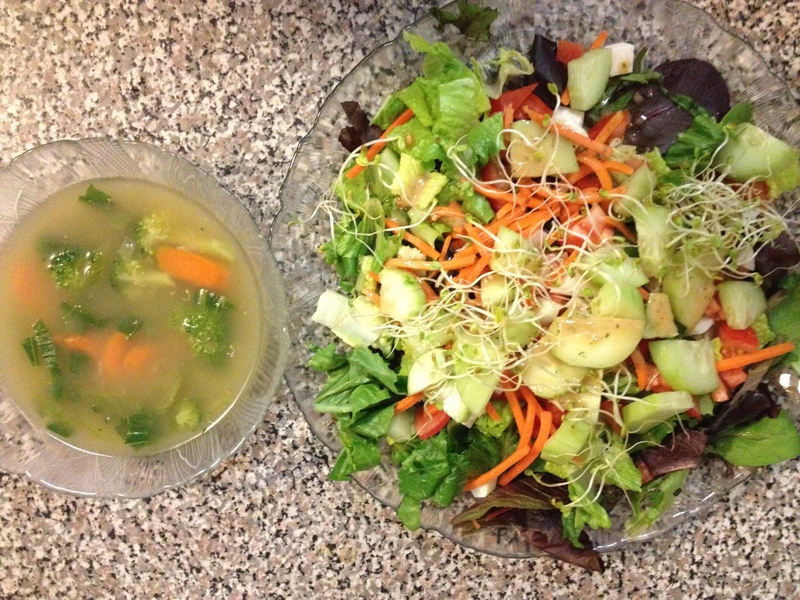 A little nervous to be going all vegetables and fruit but very excited to be on the last week of the Reset. Fitness. Health. Friends. Family. Support. Accountability.